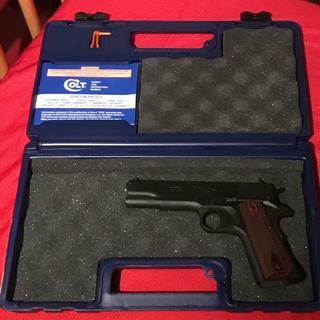 The Colt's Manufacturing GI 1991 full size is chambered in 45ACP It has a 5" barrel, steel frame, blued finish, rosewood grips, fixed sights and one 7 round magazines. Always wanted a colt. Reviews of good accuracy and reliability. Plus that blued finish is just beautiful. I'll have to buy a leather holster to match this beauty. carried one for the 8 years i was in the army. owned one for years but unfortunitely had to let it go. Is this rated for +P? I had 70- and 80-series Colts a few decades ago. This pistol seems tighter than those, probably due to closer tolerances made possible by C.A.M. This is strictly a guess, however. The sights have white dots on them but are too narrow for my liking. I can't reach the slide release with my thumb without changing my grip, so an extended release is in order. Those are the only changes I'll probably make to the pistol. The whole point, for me, was to have a 'real' Colt .45, and they don't get any more real than this one. LOVE THE PISTOL! CARRIED ONE MY 8 YEARS IN THE ARMY. This pistol lives up to it's reputation. Well built, with a nice balanced feel in your hand. You get what you pay for, and me so happy! Great Price on a great gun. Government Colt in its case. My Colt 1911, Government 1991–When I was with the 82nd Airborne in the mid-1960s. The Colt 1911 was my backup. Since my Army days, i’ve had a few 45 ACPS. My most recent purchase was an R1, a beautiful gun. But, always I yearned for a Colt. Finally, I manned-up, went to Grabagun and bought a Colt . 45 ACP. over the clunkers of thr 1960’s. i did have an initial problem. The slide did not remain open on the last round. With a Little research I narrowed the problem to defective magazines. i boight. aKim Pro Tac Mag —presto! Problem gone. The Colt and the Kim Pro Tac work in harmony with over 400 rounds of flawless reamwork. Reputable shop with good customer service. I love my Cousin lt 1911. A GREAT price on a well made gun. You cannot beat the quality of Colt and this is one of the finest 1911's for the money. You will not be disappointed. I was a bit leary of ordering online but the process was sooooo smooth. In fact, just ordered a Springfield this weekend! But back to the Colt... NICE! These bastards keep sending me weekly emails with rediculously cheap prices on guns I can't live without. They are either going to drive me into bankruptcy or divorce court. I f'n love/hate these guys. Travel through this site at your own risk. You've been warned. When is the next email coming out? Great price on a Colt! This gun is awesome! The Colt quality, fit, and finish is top notch. I always wanted a Colt but could not justify the price over other quality brands. However with the price Grab-a-Gun is selling it for I could not refuse. I also was able to benefit from the rebate from Colt which sealed the deal! The first trip to the range was flawless with a tight group and I was glad I went with this 1911. There is nothing like a Colt! The finish is beautiful. Shipping was fast and cheap and the entire transaction was flawless. Grab-a-Gun is great to deal with. Ordered on the holiday weekend (Sun) and picked it up from my FFL 3 days later. Outstanding! By far, the best price I could find anywhere. The Colt is a bit stiff but has performed flawlessly. On it's maiden voyage to the range, it pumped out 300 rounds without a hitch. I shot a mixed bag - four major brands and some re-loads, FMJ's and personal defense rounds. Hey, if I buy a hammer I'm going to pound some nails. This is a beautiful pistol. When I picked this up at my ffl I was shocked by the quality of the pistol considering the price I paid. It is absolutely incredible and it shoots wonderfully as well. The lower price point comes from the basic blue finish and lack of bells and whistles. Other than the model 80 firing group and white dot sights this pistol is a straight forward 1911 although with tighter tolerances. I missed the rebate but do not care as this pistol is worth it without it. Also grabagun has the best pricing and had it shipped to my ffl so quick I thought they shipped it via rocket. Very pleased. GrabAGun proves great service is still in practice and their prices are as low as anywhere you'll find. The new "go-to" for my general firearm purchases. Nice gun at a good price. Great service too from seller. great 1911 for the money. Got this due to the 100$ rebate. Love the weapon. The dealER immediately offered me more than my money back during ffl transfer . Shot 400+ rounds of off brand cheap ammo leaf ammo etc. Not one malfunction or issue. Tac driver atleast to 50 yrds and smooth action. I'm a glock fan for life but there is absolutely no reason I wouldn't buy this gun again and quality us even nicer in person. I would pay 800 knowing what I have aND feel it was a fair deal . 699 is a steal. Love the gun and the prices. GRABAGUN purchase #3and never an issue. Fast shipping. I have always wanted the Colt 45 Govt model and with the discount and rebate was affordable for me thanks to Grabagun. Great people to work with. I have also owned other 1911's but they were not a Colt. Thanks to GAG for a great price & to Colt for the rebate. GAG is my choice for on line gun purchases. First off, it's a Colt. Extremely well made, great to shoot. The Grabagun folks were fantastic to deal with! I was a little concerned about ordering online but will definitely be buying from them again! Insanely quick shipping. Talked my buddy into getting one too. Very happy customer! I have always wanted a Colt 1911. The price and the rebate from Colt made this offer too good to pass up. This was a great experience both from the seller and the actual product. Grabagun was fast to ship. I received the pistol at my FFL one day ahead of schedule despite the heavy holiday shipping season. I've taken the gun to the range and fired over 200 rounds with no trouble what so ever. I would purchase from Grabagun again with no hesitation. As expected from Colt and Grabagun.com. ... A+++. Great pistol! Carried one for 4 years in the MPs during the 70s. Forgot what a great gun it is. Put 150 rounds through it without a hiccup and a smile on my face. Grab A Gun is the best online dealer with the best pricing and fast shipping. I don't always write gun reviews, but when I do it's because everything was outstanding. GrabaGun price was the best by far on the internetz. The Colt $100 rebate put the price at $604.00 delivered to the FFL. The handgun is flawless in form and function. I've put 150 down the pipe so far. Did i mention the Prancing Pony on the roll mark! This was my third purchase here. Still a few days left on the rebate so If you're on the fence get busy. Uneventful ordering experience. Ordered online Sunday night-at my FFL Friday after Thanksgiving. Beautiful firearm; not a blemish or tool mark. 250+ rounds and no problems. POA and POI are right on. Seven rounds at 10M produces one big hole. GAG had best price plus $100 rebate from Colt sealed the deal. "GRAB" one now! Gorgeous out of the box, flawless performance and very accurate operation. I would never hesitate to buy a Colt again. Best prices found anywhere right here at grabagun. I've owned 2 of the original M1991A1's in the parkerized finish and still have one of them. Great basic GI style pistol. No frills. Was surprised when the parkerized went away and the stainless and blued came into being. I look forward to my new one in blue. This is my second purchase from GrabAGun and their pricing and ease of order is the reason. When Grabagun got these in stock, I jumped on it. The buying experience was great. Super, super customer service. every step of the way.The gun itself is simply what it is, John Moses Browning's masterpiece, as timeless and as accurate as they have always been . Sweet shooting, perfect from the box. Can't wait to get another . Very well built, quality handgun. Enjoy shooting it with my father at our local gun range. Great customer service and shipping from GrabaGun.com. A real Colt at a bargain. Product (Colt 1991A1) was offered at absolute lowest price, and Grab A Gun didn't tack on any service fee for a credit card purchase. Shipping to my FFL was extremely reasonable ($5.00 or so), fast (product was delivered to my Ohio FFL in two days). Entire experience was positive, and Grab A Gun will remain at the top of my vendor short-list. It's a Colt. What else needs be said? This pistol feels so good in my hand. It has the look and feel of the same pistol I carried in Vietnam. I have several other 1911's, from Rock Islands to Remingtons,and I love them all, but this Colt is special to me. I used it while I served in Taiwan's army in the early 70's. I love it deep from my heart. It's powerful, accurate and reliable. The Colt Firearms 1991A1 GI .45ACP 5 inch Blue is a very stylish model to own if you are looking for a compact yet effective weapon. There are so many positive features about this model of firearm and you will be very pleased with its handling and efficiency. At its full size it is only 5 inches and the steel frame with the bluish tinged finish and rosewood grips, makes it a very attractive model. This semi-automatic model of firearm does adopt the usual standard feature of others in the same category and has inclusions like fixed sights and white dot rear and front point indications, a beveled magazine allowance and the thumb safety fixtures.